When I talked to a number of people and asked them about Subic, what I found out was quite astonishing. Many of them thought that Subic and Clark are one and the same. So just so we’re clear, Subic and Clark are two different areas. I think the confusion stems from the fact that both have “freeport zones”. Clark Freeport Zone (CFZ) is a former US air force base (Clark Air Base), while the Subic Bay Freeport Zone (SBFZ) is a former US naval base (Subic Bay Naval Base). Both have been converted to massive business and recreation centers. 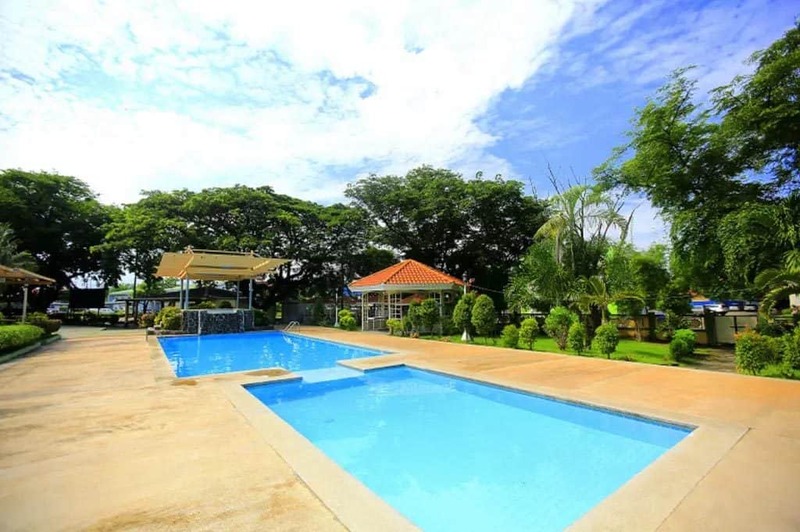 Search for more Subic Hotels! 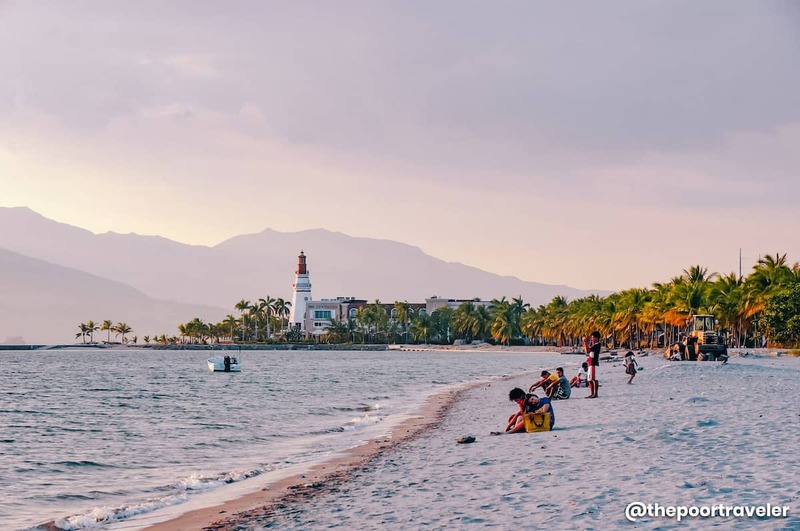 When is the best time to visit Subic? How can I get around Subic Bay Freeport Zone? How will I know the exact fare for the taxi ride inside SBFZ? Subic is a town in the province of Zambales. Located along Subic Bay, the municipality is known for maritime industry and logistics and warehousing services. 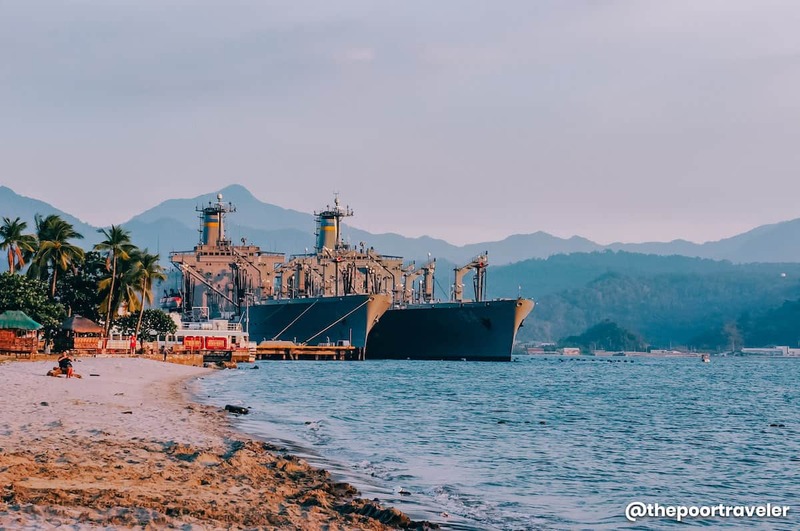 The Subic Bay Freeport Zone (SBFZ) covers the municipality of Subic and city of Olongapo in Zambales and the municipalities of Morong and Hermosa in Bataan. The conversion of the former U.S. Navy Base to an economic zone bolstered by the area’s commercial and industrial piers had catapulted the development of the Central Luzon region. The tourism industry is also one of Subic’s strongest assets. The zone promotes ecotourism through guided treks and jungle survival tours. Aside from that, it boasts theme parks, diving spots (wreck diving), sailing, extreme water sports, and adventure parks. Outlet shops and duty-free shopping centers also attract tourists, especially those who like shopping and finding great deals. Language: The province of Zambales has three main languages — Tagalog, Ilocano, and Sambal. Currency: Philippine peso (PHP, ₱). PHP100 is around USD 1.89, EUR 1.67, SGD 2.56 (as of March 2019). Modes of payment: CASH is preferred. Credit card payments are widely accepted, especially in business districts. If you are going outside the urban zones, ensure that you have an ample amount of cash with you. Connectivity: Strong data signal for both Smart and Globe, especially in urban areas. Electricity Info: 220V, 60Hz. Mostly, Socket Type A. 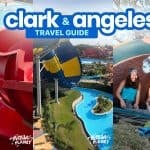 Note: This travel guide will touch the municipality of Subic and Olongapo City. There are two gateways to Subic — the Clark International Airport and the Ninoy Aquino International Airport. The former (CIA), is the closest, located further northeast of Subic, while the latter (NAIA) is located in Manila. Subic is usually included in the itinerary for road trips up north. North Luzon Expressway (NLEX) and Subic-Clark-Tarlac Expressway (SCTEX) connect Subic to Metro Manila. Bringing a car allows you to travel at your own pace and make a restroom break stop whenever necessary. Drive along NLEX until you reach the exit to SCTEX. Take the SCTEX Exit and continue driving to SBMA. The travel time is two to four hours, depending on the traffic condition. Whether you are coming from NAIA or any point in Metro Manila, travel to Victory Liner Bus Terminal. You can go to Pasay, Cubao or Caloocan terminal. The bus company plies to Olongapo from Manila daily. Bus leaves every 30 minutes. The buses are air-conditioned and have wi-fi on board. Get on a Victory Liner bus bound for Olongapo. The fare is P230-290. The travel time is two to four hours. There’s normally a toilet break halfway. From Olongapo, you can ride a jeepney or taxi to Subic/SBFZ. The fare varies depending on your destination and chosen mode of transportation. Note that jeepneys in Olongapo are color-coded per route. You can find more information about the jeepneys on the How to Get Around section below. Note: If you are spending the night in Subic, you can check with your hotel if they have service from Olongapo Bus Terminal or Clark. Alternatively, if you are coming from NAIA, you can take the P2P bus bound for Clark Airport. 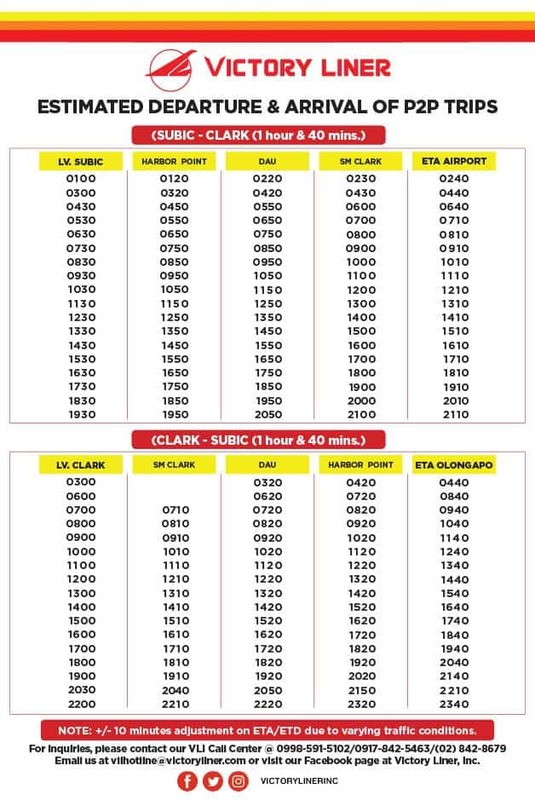 From Clark airport, you can either take the taxi to Victory Liner Dau-Mabalacat Terminal and take a bus to Olongapo Bus Terminal or you can take another P2P Bus to Subic. If you are coming from Clark, take the SCTEX and follow the road signs directing you to SBMA/SBFZ. The travel time is about 45 minutes, depending on the traffic condition. From the airport, take a jeepney to the Main Gate Entrance of the Clark Freeport Zone. From there, ride another jeepney to Dau-Mabalacat Bus Terminal. Board a Victory Liner Bus bound for Olongapo at Dau-Mabalacat Terminal. At Olongapo Bus Terminal, take a jeepney to Subic Town or SBFZ. Travel time from Clark Airport to Dau Terminal is about 15 minutes. You’ll get to Subic in less than an hour. Total fare depends on the modes of transportation you choose. If you have light luggage with you, you can go for the jeepney. It’s a cheaper option. But if you have big and more than one piece of luggage, it’s recommended to take the taxi from the airport to Dau Bus Terminal. Or you can take the P2P bus service from Clark Airport to Olongapo. According to 12Go, there are also shuttle buses or tourist buses available. There are two companies offering direct transport service from Clark/Angeles City to Subic – Southern Cross Shuttle and Swagman Resort. Southern Cross Shuttle operates daily, while Swagman Resort Bus only operates four days a week (M, W, F, Su). It is better to reserve a slot in advance. Both have designated pick-up and drop-off points in Angeles and Subic. The fare is quite steep at P500 per person. Jeepney. The jeepney is the primary mode of transportation for the locals, but it’s also very tourist-friendly. The jeepneys are color-coded per route. This way, it is easier to determine which jeepney one should take going to a certain destination or point. Tourist will likely use the Yellow, Red, and Blue Jeepneys. Yellow Jeepneys shuttle along the main streets between Sta. Rita in Olongapo and the Subic Bay Freeport Zone Main Gate. Red Jeepneys cut through the side streets between Gordon Heights and the SBFZ Main Gate. This jeepney serves the bus terminal in Olongapo. Blue Jeepneys run from Olongapo city center to Subic town (Barretto and Baloy). This route covers the coastal areas. The fare ranges from P8 to P15. If you are curious about the other routes, you can check it here: Color Coded Jeepneys of Olongapo. Note: If you are going to Subic Bay Freeport Zone, jeepneys are not allowed inside the premise. Tricycle. There are a lot of tricycles in Subic town and Olongapo. “Trikes” can shuttle passengers following a particular route they chose to anchor their plate numbers to or they can function as a taxi by offering special trips, which usually works with tourists. These special trips can cover both short and long-distance route. The fare can range from P10 to P150. This includes the rate for a special trip from Olongapo Bus Terminal to Barretto in the municipality of Subic. Like the jeepneys, tricycles are not allowed inside the Subic Bay Freeport Zone. They can only go as far as the main gate of SBFZ. Taxi. Unlike the jeepneys and tricycles, taxis are allowed inside the SBFZ. Taxis operating inside the Subic Bay Freeport Zone have fixed rates and have a fare matrix displayed inside. Meter service is non-existent here. Outside SBFZ, you can find a significant number of taxis in the city center, especially around Olongapo Bus Terminal. You can just negotiate the fare with the driver. The fare ranges from P50 to P400. Coasters and Mini-Buses. 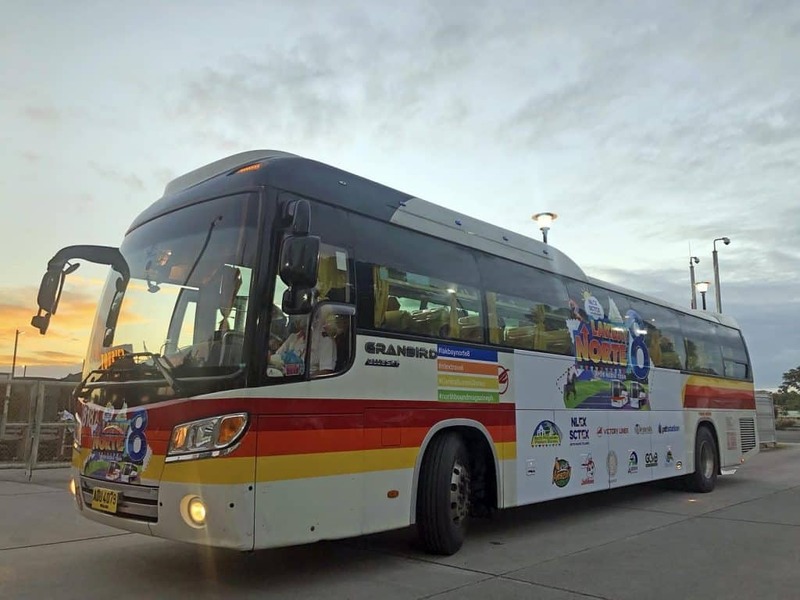 Buses (Winstar), coasters, mini-buses operate inside the Subic Bay Freeport Zone. Their function is the same as jeepneys but only run inside the freeport zone. This is the cheaper option if you don’t like taking the taxis, but according to those who have tried it, the waiting can sometimes test your patience. The terminal is located at the main gate and can shuttle passengers directly to their hotels. Subic is sandwiched between densely forested mountains and Subic Bay. The mountains boast rugged trails yet to be charted. Among many trekking sites, the El Kabayo Subic Trail is relatively new. Under MAD Travel’s Tribe and Trek program, participants are exposed to the flora and fauna enveloping the trail while learning about jungle survival and making herbal medicine. This activity aims to help our indigenous tribes protect and preserve their ancestral domain by educating and helping us understand the importance of our natural heritage and sustainable tourism. 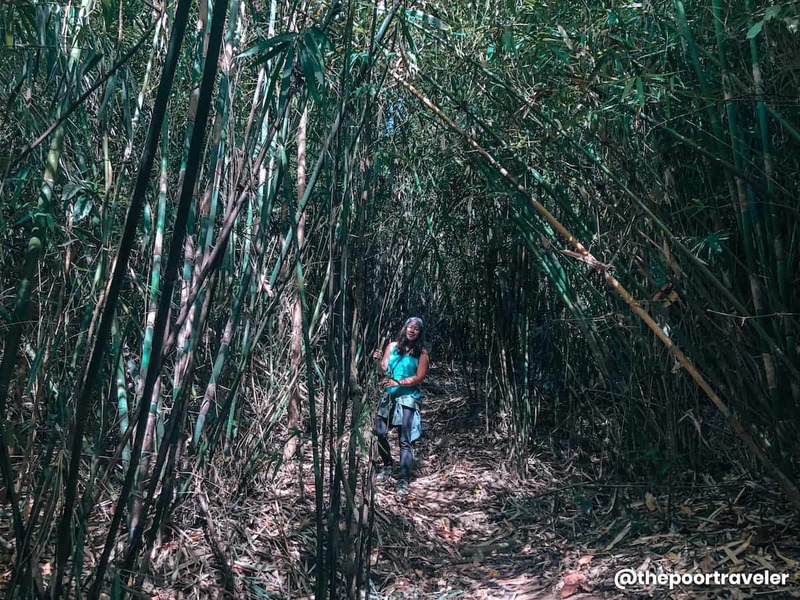 The El Kabayo Subic trail is home to the Aeta’s Pastolan Tribe. Check out the waterfalls too near the end of the trail. Rates: P1,800/pax (Day Tour) This rate covers transfers within Subic, meals (lunch and snack), local guides (they can communicate in English too), and the jungle survival training. For group/corporate package, you may inquire through their e-mail address and contact number. Location: Subic-Bataan Territory. El Kabayo Subic Trail pick up point at The Lighthouse Marina Resort. The home of the biggest floating unicorn in the world! Subic’s Inflatable Island is perfect for kids-at-heart. It’s a giant floating playground where you can slide, bounce, and swing! It’s the ultimate bonding experience for friends and families. Klook offers tickets to the Inflatable Island at a discounted rate. Each ticket can give you access to Unicorn Island, Samba Beach, and Bali Lounge. ✅ CHECK RATES or RESERVE TICKET HERE! 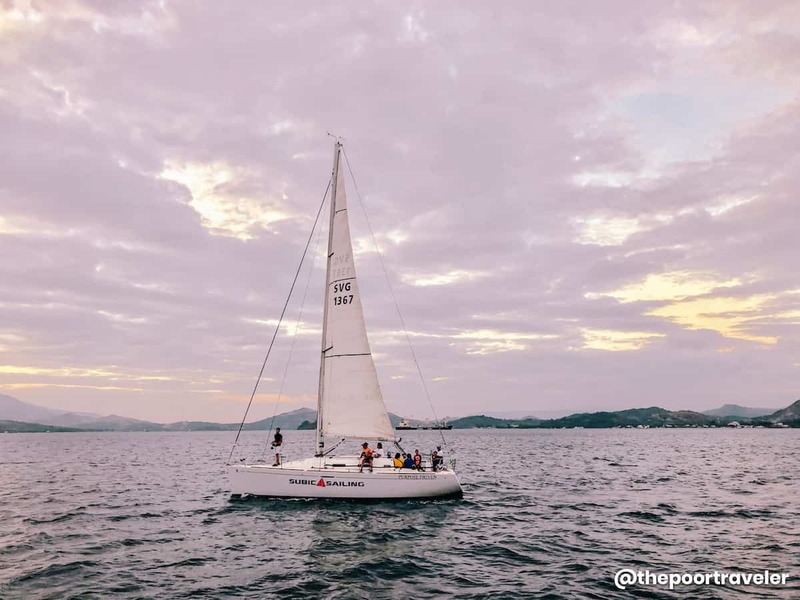 Subic Bay is known for its deep calm waters. It is also said to be one of the biggest naval bases of the U.S. Navy outside their motherland when it was still operational. Beyond the lush forests and the coasts, Subic Bay is laden with several vintage shipwrecks and WWII remnants that are drawing wreck diving enthusiasts, local and international divers alike. Para sa mga mahilig sa wasakan at pilit inuungkat ang nakaraan. Haha! Some of the shipwreck sites are only around 15 minutes from the diving centers. Whether you are just starting to learn diving or already an expert, the rich marine ecosystem offers a great underwater adventure. Some of the shipwrecks in Subic Bay are the USS New York, the USS Lanikai, the Oryoku Maru, and the Sakura Maru. Several dive centers and operators are stationed around the Subic Bay area. Rates vary depending on the course, number of sessions, and the inclusions, but recreational wreck dive prices usually range from P1000 to P3000 if you have your own gear and P1500 and P3800 if you’re renting gears too. Some operators like Arizona Dive Shop allow non-divers onto the boat and let them snorkel instead. Snorkeling fee with gear rental costs P1000 to P1200. Mangroves thrive best in tropical areas. The Philippines alone cradles about half of the world’s mangrove species. Mangrove forests play an important role in maintaining the balance in our ecosystem for both land and sea. Protecting our mangrove forests means protecting our environment and our future. Subic Bay has over 60 hectares of mangrove forests scattered in six different sites including the Olongapo Bay Area, Triboa Bay Area, and Ilanin Bay Area. Source: SBMA Ecology Center. The most popular site is the Triboa Mangrove Park. The best time to go is early in the morning or at dusk during the dry season. Take note of the tide condition too. Here are the rules and regulations when visiting the mangrove forest sites. Please follow them. Respect the area and be highly aware of the environment and your actions at all times. Don’t take anything with you — plants or animals. Don’t catch the crabs and other crustaceans and don’t ever step on mangrove roots and other vegetation. Move as little as possible and be quiet to avoid disturbing the wildlife. Do not play loud music. Don’t litter. Don’t smoke. If you need to use the toilet, there are restrooms available. For inquiries, sponsorships, donations, and other concerns, please contact SBMA Ecology Center. If you want to report any violations, you may also direct your concern to their office. Of course, even abroad, Filipinos are known to spend money on shopping especially for souvenirs, stuff they can bring home to their loved ones. The “pasalubong culture” is strongly ingrained in most, if not all, Filipino travelers. There are plenty of shopping and dining facilities in Subic, the most popular are the outlet stores and the duty-free shops. Borrowing Subic’s tourism catchphrase, “It’s More Fun-tastic in Subic!” Agree? After a day of beach bumming, you can put on your bagain-hunter hat and go duty-free shopping! Aside from the beaches, you might want to take a look at the stores on your way back to Manila. Beach + retail therapy. No other formula is more effective in relieving stress. It may not be as fair as Boracay or any other beach you frequent, but the beach here is okay with grayish sand hugged by gentle waves. 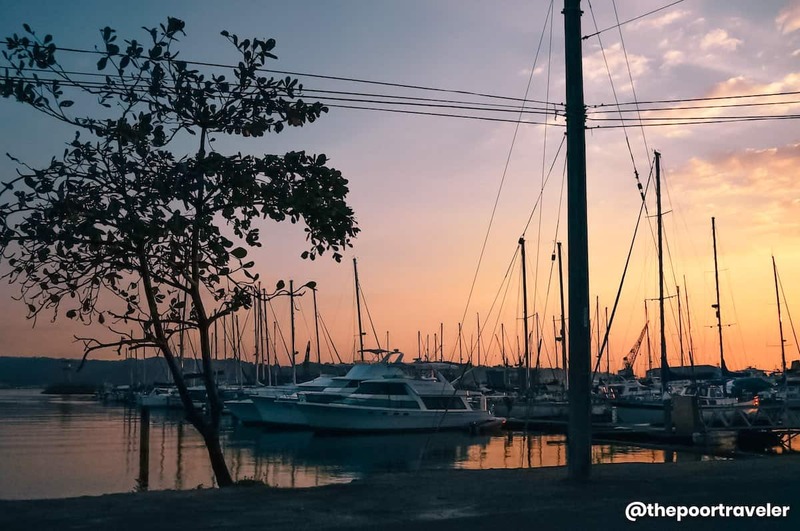 Subic Bay presents a spectacular sunset on a clear day. 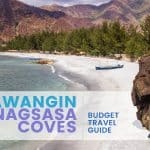 There are many great spots for sunset-watching around the Subic Bay area — Malawaan Park, Boardwalk Park, The Lighthouse Marina Resort, and the whole stretch of Waterfront Road where you can also find the Inang Laya Monument, The Hellship (Oryoku Maru) Monument, and Children of the Sun Returning Monument. Further north, you can both enjoy the beach and the view of the sunset at Baloy Beach, Manga Beach, and Sierra Beach. You might be wondering why we included a yacht cruise. You might be thinking it’s expensive. Well, it is. Haha. But there are ways to lower the cost. If you’re a big group, this is something to consider especially if you’re celebrating an occasion. 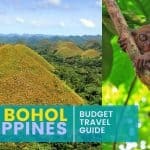 If you can spare over a thousand bucks for an island-hopping tour in other parts of the country, you might want to consider this too. It’s just like joining a group tour. If you’re a big group, you can scratch this off your bucket list for as low as P1050 per person. 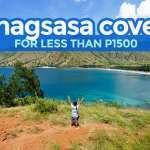 So, gather all your friends or your family and enjoy this unique and “nakaluwag-luwag” experience. This is also a perfect romantic getaway, especially when you do it at dusk for the beautiful sunset. If you like it, put a ring on it. Hihi. 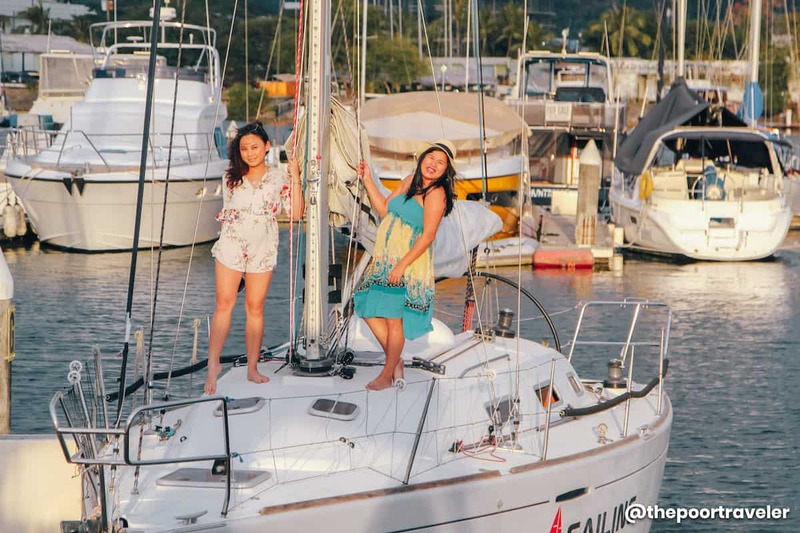 Subic Bay is gaining attention in the Asian sailing circuit. Its flat waters and the wind condition make it a challenging sailing destination. Other sports in Subic Bay are dragon boat racing, propulsion jetting, kayaking, jet skiing, and parasailing. Yacht Cruise Rates: P18,000 for 10 pax and P21,000 for 20 pax. These rates are inclusive of two-hour cruising with food and drinks. Rates: Rates depend on the type of boat you will rent, the capacity, the number of hours, and other inclusions. 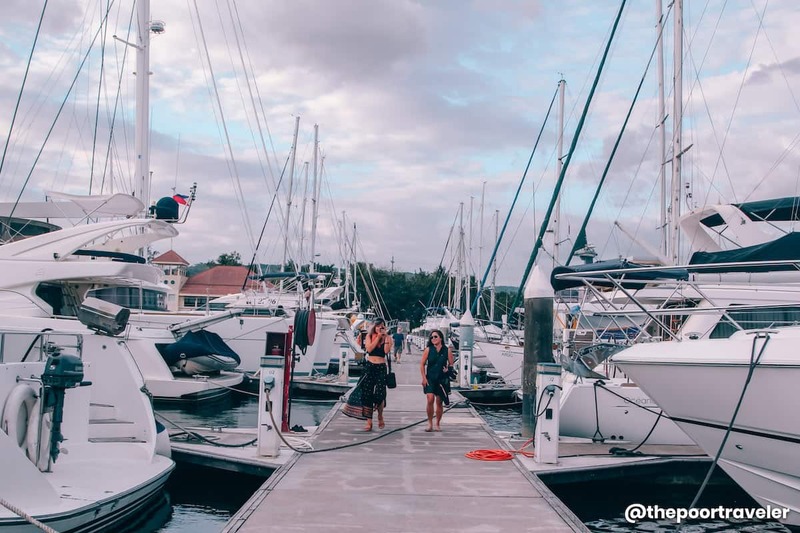 Subic Sailing Club offers different vessels such as yachts, speedboats, and sailboats. Being a major maritime gateway and almost a century of US Naval Base presence, Subic is one of those destinations near Manila that had an early taste of development, encouraging the establishment of different kinds of businesses such as logistics and shipping industries, restaurants, hotels, recreation and entertainment centers, shopping malls, and adventure parks. 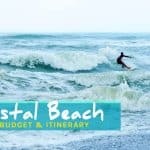 If you have the budget, consider spending your nights at an awesome hotel or resort. This will tremendously elevate your Subic experience. Subic is one of those destinations where there aren’t a lot of arresting sights or mind-blowing landscapes. Tourists come here mostly to relax and unwind. If this is also why you’re traveling to Subic, where you stay can spell the difference between typical and unforgettable. Le Charme Suites Subic. Check Rates & Availability! 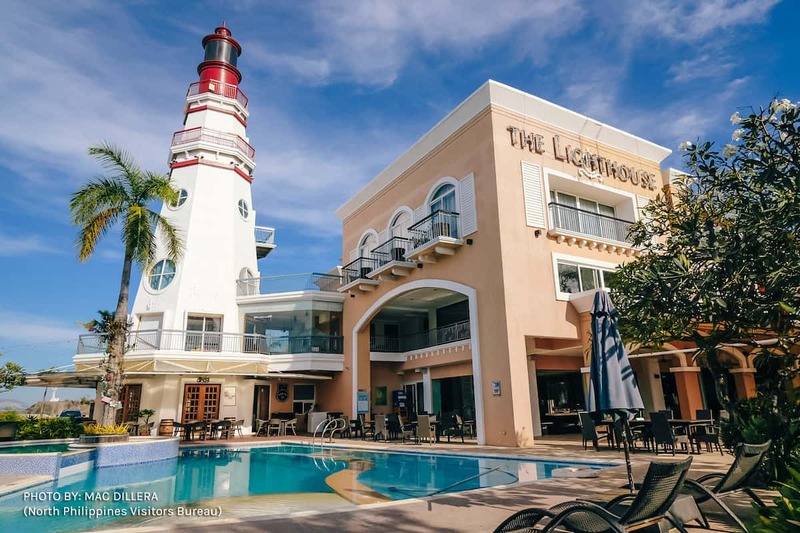 The Lighthouse Marina Resort. Check Rates & Availability! If budget is a concern, here are some properties that are still great according to Agoda reviews but more pocket-friendly. Subic Bay Peninsular Hotel. Photo was provided by the resort via Agoda. Subic Bay Peninsular Hotel. Check Rates & Availability! Mango Valley Hotel 1. Check Rates & Availability! Subic Coco Hotel. Check Rates & Availability! Subic Bay View Diamond Hotel. Check Rates & Availability! Here are two sample one-day itinerary options for Subic. 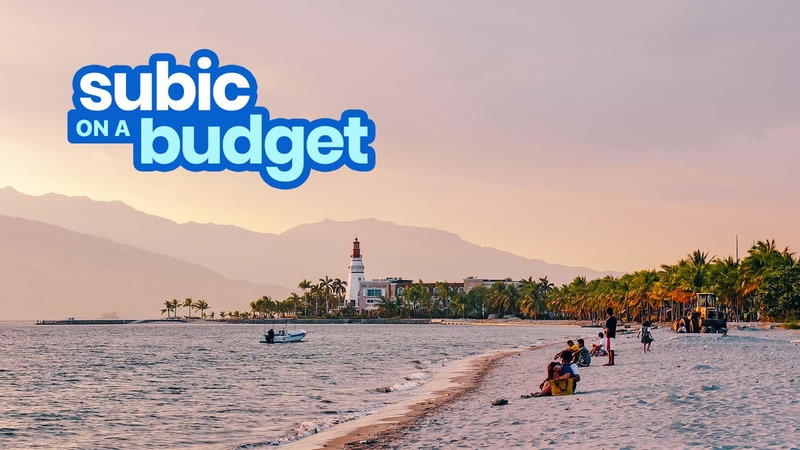 You may tweak this depending on your budget and the number of days you want to spend exploring Subic. 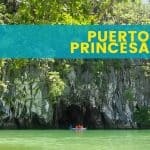 The itinerary above will set you back around PHP 1,500 (USD 29, SGD 38, EUR 25), excluding accommodations but including a little bit of allowance for any miscellaneous expenses along the way. If you have extra money to spend and you don’t want to worry about transfers within SBFZ, local guide, jungle survival training, and lunch for the trekking activity, you might want to consider MAD Travel’s El Kabayo Trail Tour Package. The itinerary above will cost you around PHP 1,300 (USD 25, SGD 33, EUR 22), excluding accommodations but including a little bit of allowance for any miscellaneous expenses along the way. Leave nothing but footprints. Be mindful of your actions. Collect your garbage and practice proper waste disposal. Practice sustainable tourism. Help the local community by buying their products. Reduce waste by bringing your own water bottle and dry bags (or eco bags) instead of buying plastic bottled drinks and plastic bags. December – May. Most of the attractions in Subic are done outdoors, so it’s better to go there during the dry months. High summer months are April and May, but summer begins as early as March. The rainy or wet season is from July to October with the highest chance of rainfall in July, August, and September. Tricycles and Jeepneys are not allowed inside the premises, but they can drop you off until the Main Gate. From there, you can choose to take a fixed rate taxi or take the shuttle bus. Fares are regulated. The accredited taxi operators follow a set fare matrix which is displayed inside the taxi. You can book in advance or just hail when you see an unoccupied one. Note that phone booking will incur a certain amount of fee (pick up charge), which can range from P30 to P100. This is on top of the fare, which ranges from P50-P400. There are also restrictions like a maximum of four (4) passengers only per taxi and one drop-off point per ride. I’m grateful to the North Philippines Visitors Bureau (NPVB) and the North Luzon Expressway (NLEX) Corporation for having us again on their Lakbay Norte project. This year, we’ve covered Clark, Subic, and Baler for the Lakbay Norte 8 familiarization trip. 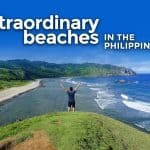 The North Philippines Visitors Bureau is a non-stock, non-profit membership-based umbrella organization of Convention & Visitors Bureau (CVB) all over North Philippines. The aim is to promote destinations through events & conventions. Wow! really wonderful. It was really wonderful. It was some good tip for me .Thank you very much for the post.